Sometimes it can be difficult to describe a particular process your customer needs to go through, then sending a screenshot or a dedicated guide to a customer can do the trick. The same goes for customers: it can be easier to show a problem then to write a lengthy description. In such situations, both agents and customers can send a file over LiveChat to reach an understanding faster. You don’t have to limit yourself to just screenshots. You can send your product catalogues and other marketing materials too. To share a file over LiveChat, you need to click on the More button during a conversation with a customer. Next, click on the Upload Files button and select your file. 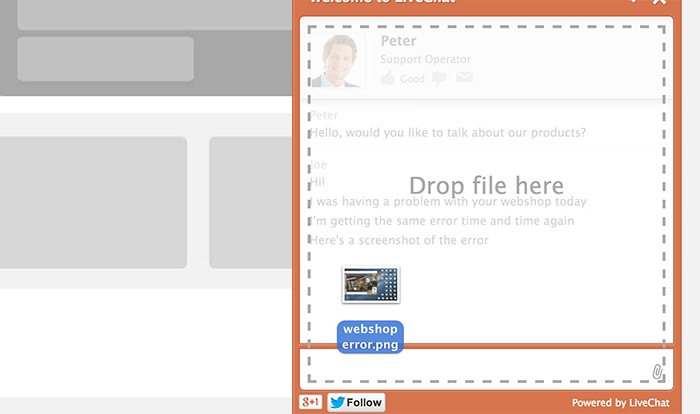 Alternatively, you can drag and drop the file on the chat window. You can upload any number of files this way by either selecting a few files from the list holding Ctrl/Cmd or dragging a few and dropping them to the chat window. Remember that each file can’t be bigger than 10 MB. All the files you select for upload will be listed before sending. You need to click on the Send button to send the file. Your customers can also upload a file by clicking the small paper clip icon and selecting a file. They can also drag and drop the file to the chat window. After a file has been uploaded, both the agent and the visitor will receive a link to the file in the chat window. The link can be accessed from chat archives or a chat transcript later on. 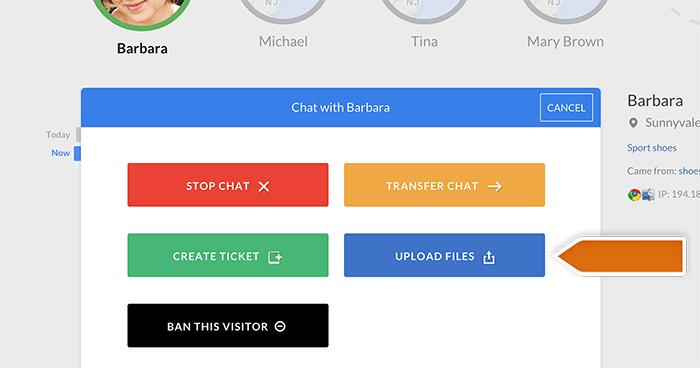 You can choose to disable file sharing for agents and visitors. To do that, go to the file sharing section and use the checkboxes to enable or disable file sharing for agents and visitors. Remember to click on the Save changes button after you are done. Any file that can be a potential threat will be automatically filtered out by LiveChat. You can then decide whether you want to have access to it or not by choosing Get access or Discard. This affects all MIME application type files, including .pdf files. The warning will show only for agents when a visitor uploads a file. Once you choose that a file shouldn’t be accessed, you (and other agents) won’t be able to click on the file link and download it. The same goes for the link to the file in the chat archives. This ensures that agents don’t accidentaly open files that may harm their computers or do some other kind of security-related damage. You can undo this action by clicking on the Get access button.